With an orchestral style, you hold the stick somewhat loosely. Your goal is to bounce the stick head off of the drum. All movement is including arm movement is acceptable. Remember, movement through the air is just as important as the drum stick impact. For match style, your pointing finger is your focal point. 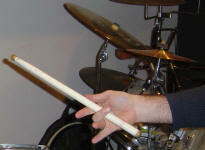 Your middle, ring, and pinky fingers should dangle closely to the stick. The faster you play, the looser these fingers. Arm movement is encouraged especially with accents. Hold each stick head about 7 inches or so above the drum head. The stroke goes from the starting position, stroke down, bounce off head, back to starting position. Strive for a minimal but pretty drum stroke movement including when moving from one drum to another. Your focus is on bouncing the stick head off the drum head and drawing out the maximum sound quality of each instrument you strike. Practice stroke variations on each instrument (drum, cymbal, bell, etc.) with various strengths, height, hit through vs. bounce, etc. With each stroke variation, listen to the quality of the sound you are drawing out of the instrument. Use a marching style to achieve strength and accuracy. A marching style is a great way to build your chops. An orchestral style is used to achieve a more musical sounding play. With a marching style you hold the stick tighter than with an orchestral style. The goal of a marching style is to try to hit through the drum head with tremendous accuracy and strength. 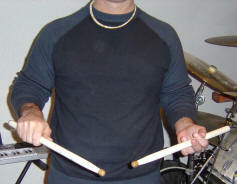 The tighter grip also helps multiple players to play and look the same but you sacrifice a bit of the musicality of playing drums. For match style, your middle finger is your focal point. Wrap fingers all the around the stick. Do not hold the stick tightly, but have the feeling of all fingers touching the stick with very little to no gap. Very little to no arm movement. Exceptions are clearly discussed and agreed upon prior to usage. For example, many marching groups agree to rock your arm back and fourth with open rolls. Hold each stick head about 1 inch from the drum head. The starting position. The stroke goes from the starting position, stroke up, stroke down, hit through the drum head, then return back to starting position. Focus on moving the drum stick straight up and down. 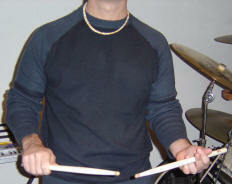 When playing fast, watch the movement patterns of your drum sticks. A pretty movement pattern makes for a better sounding drum stroke. Your focus is on hitting through the drum head. The focal point for a marching grip is the ring finger.